Three-time Stoker Award winner Linda D. Addison grew up in Philadelphia and began weaving stories at an early age. She moved to New York after college and has published over 200 poems, stories and articles. Ms Addison is the author of “How To Recognize A Demon Has Become Your Friend” Short stories and poetry (Necon E-Books, 2011) and the first African-American recipient of the world renowned Bram Stoker Award. She is the author of four collections: “How To Recognize A Demon Has Become Your Friend” (Necon E-Books), “Being Full of Light, Insubstantial”, “Consumed, Reduced to Beautiful Grey Ashes” and “Animated Objects” (Space & Time Books). Her work has also appeared in numerous publications, including Essence magazine, Asimov’s Science Fiction magazine and Doorways magazine. 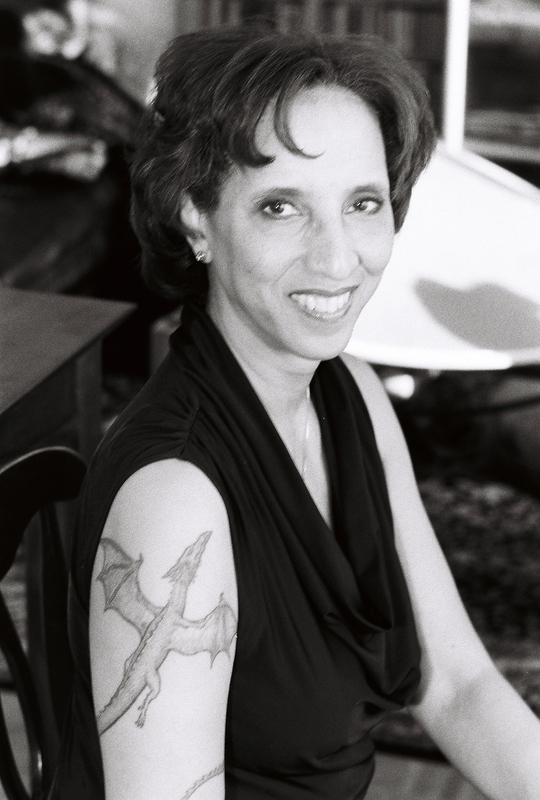 She is the only author with fiction in three landmark anthologies that celebrate African-Americans speculative writers: the award-winning anthology Dark Matter: A Century of Speculative Fiction (Warner Aspect), Dark Dreams (Kensington), and Dark Thirst (Pocket Book). 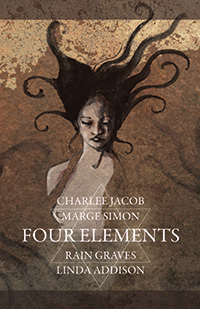 Four Elements: Four Bram Stoker Award™ winning poets join together to paint a rich, dark tapestry of evocative emotion in The Four Elements. From modern interpretations to ancient mythology, they explore the magic and mystery of Fire, Water, Earth, and Air. Their vivid poetry and prose brings to life a universe in a grain of sand, taking the reader through a journey of discovery from the inside out. Hear the hot voice of invisible awareness in Linda Addison’s interpretation of Air. Explore the realm of ethereal and surreal liquidity in Rain Graves’ Water. Burn from crevice to crown in Charlee Jacob’s wild-eyed visions of Fire. Contemplate Marge Simon’s poignant twists of dark irony to eruptions of spontaneous wonder in Earth. There is something for everyone in The Four Elements–conjured especially for the reader that likes to examine the meticulous depth and meaning in every word. Q. Before you started writing, you were an accountant and majored in Mathematics. In that period of time, did you ever imagine that one day you would be an accomplished and award winning writer? A. No, I didn’t see myself winning awards and I certainly didn’t imagine having close to 300 poems, stories and articles in print. The big dream then was getting published in a publication that you could buy in a bookstore or magazine stand. Growing up the oldest of nine children made me very aware of wanting to have a job that would pay well enough for a comfortable life. I associated being a writer with being poor. Since I was strong in mathematics and science I went that route in college. I wrote stories and poems before college, even had some published in my high school paper. When I was in college I still wrote for myself and didn’t concentrate on sending any pieces out for publication. I always knew writing would be part of my life but I didn’t get serious about submitting work until I graduated from college and came to New York. Winning awards always seemed indefinable to me. I loved watching the Olympics and to know that the top five or ten athletes in the world were trying to be the number one seemed unfair so I didn’t think much about winning awards for my writing. Especially since I knew I needed growth with my writing skills to even get published. Q. Early in your writing career, you were published in “Asimov’s Science Fiction Magazine” – I am a big fan of the publication. How did it feel when you first found yourself published there? A. I was so happy. Even thinking about that now gives me chills. Isaac Asimov was one of the science-fiction writers that I admired. I had an opportunity to see him a few times before he passed and even had face recognition since there were so few African-American women at science-fiction events. I still have the first couple of years of the magazine and have maintained a subscription from day one. It took years of sending them anything I wrote that was even vaguely speculative. I collected a lot of form rejections, until one day I got a personal rejection. That was huge, I felt like I was getting closer to being published. The first time in the magazine was so exciting. I walked about Manhattan, stopping at magazine stands and bookstore just to look at the magazine and see my name in it. I’ve been published a few times in Asimov’s SF Magazine since then and it’s still wonderful but that first time was unforgettable. Q. You are the first African American winner of the Bram Stoker Award and have won the prestigious award three times for your poetry collections. You have broken ground for every black writer to follow after. How do you feel about this achievement? A. When I attended the HWA Bram Stoker© awards years ago I didn’t have anything on the ballot but I remember when Tananarive Due had her first book on the final ballot. I was so excited to meet her at the event because there were so few African-Americans attending. I thought she would win but she didn’t. She is creating an expansive career since then and I’m proud to know her and her husband, author Steven Barnes. It didn’t occur to me that I would win, even when my first book, “Consumed, Reduced to Beautiful Grey Ashes” made the first cut to the Preliminary Ballot. By the time I got to the Final Ballot I felt like I had already won, seriously. You hear people say that and I know how they feel. The day I found out I was on the Final Ballot I was ready to celebrate. I was on the Final Ballot with poets who were my idols like Charlee Jacob and Bruce Boston. Chad Hensley was also well published and his book was excellent. No reflection on my book, I loved it (still do) but I was sure Charlee or Bruce would win. I was stunned and beyond excited when I won and blessed that my mother attended the awards. I made her stand during my acceptance speech because she was such a fantastic storyteller and inspiration for me. It was only in looking over the past winners later that I realized I was the first African-American to win. I was surprised and humbled. So far I am still the only African-American to win this award but I’m looking forward to someone else jumping into this pool with me. Q. You did not begin publishing your works until you had some life behind you, and had spent quite a while married and raising a child, something you have in common with Toni Morrison and Alice Walker, who began to create award-winning works in their late 30s and 40s. I didn’t start to write novels until that age myself, so I am wondering if you think that the changes that we go through in mid-life such as freedom from care taking roles, for example, are in any way associated with us finding at last, our voice? A. This is definitely true for me. When I first started writing it was about personal reactions to the world. Over time, having experienced joy, loss and all the things that life presents I began to write in a broader sense. I listened to the universe around me. My voice expanded and became second nature. I also spent years writing, making mistakes, working on writing better (which I still do), and writing in different ways to stretch my chops. It has been said we have to write thousands or millions of words before we find our rhythm. There is something to that. I can remember years ago struggling with dialogue and spending time listening to people talk, reading dialogue that worked, reading my own work out loud until that wasn’t such a big problem. Then I would work on something else that I wanted to make stronger. Writing is on of the careers that can get better the longer you live because it will deepen your sense of the world, if you allow it. Q. Women in horror writing are rare, and women of color exceedingly so. Do you think that is beginning to change? A. I do think this is changing. 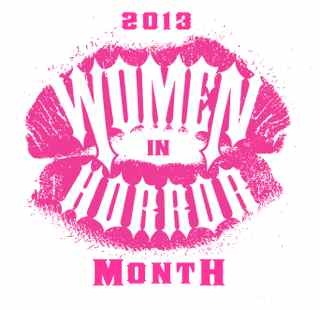 You created a list of 20 Black Women in Horror Writing. Ten years ago that list would have been much shorter. Sheree Thomas’ Dark Matter speculative fiction collection, published in 2000 by Warner Books, was an ice breaker that introduced the world to many speculative writers from the African Diaspora. I had been published before but few people knew I was African-American until my story was published in Dark Matter. It was the beginning of an exciting time. 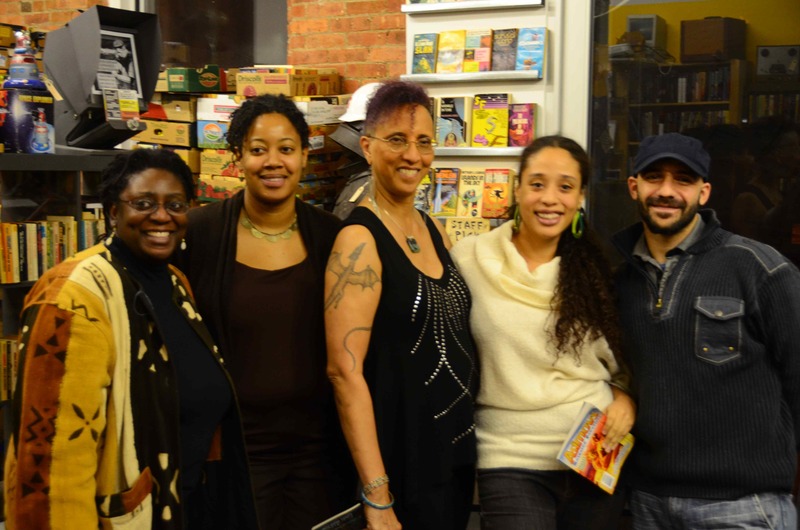 Warner had us doing signings and readings and we got to meet young African-American writers who were interested in the speculative field. I have to believe that anthology helped young writers see themselves published writing speculative fiction. Q. Do you think that writing poetry is a different experience for the writer than prose? A. I can only speak for myself, but poetry is pretty much always drifting through my mind. I hear it like background music. I journal every day and jot down bits and pieces which then later become poems or stories. It comes through me like breath. There’s an instant gratification that happens when writing a poem, even with rewriting I can usually create a finished poem in a day. That doesn’t often happen with a story. My fiction is character-driven and I take the characters very serious. It takes time to get to know them, what they are willing to do to get what they want, etc. I certainly enjoy writing prose, but it is more work to get the right balance of story, character, tension and resolve. I have written a story as a poem and vice-versus; it’s a different way of writing. A. The collection is written as a poem/story/poem/story…and covers the spectrum of horror, science-fiction, fantasy. I started working on it after my mother passed. It was so hard to sit down and write but somehow when I started, the flow came back. I’d like to think it was also my mother’s spirit helping me somehow get back to what I was born to do. The cover is amazing and was done by Jill Bauman. We go way back and I always wanted to have her art on a book but she works with authors like Stephen King and so forth. It was a dream come true to have her do the art. By the way, the hands on the cover are my hands. She took a picture of my hands in that position, but I didn’t know what the cover would look like until she finished it. This book is a good way for people to start reading my work because it is a mix of poetry and prose. I was truly stunned when they announced my book as the winner because once again I was up against amazing authors. Q. I also want to know about “The Four Elements” – I know Rain Graves, we did a book reading together back in October. What can you tell us about that book and your role as “Air”? A. My section, Air, is all new poetry and is a story of a person who suddenly finds themselves transformed into air. The poems follow their journey through time, space, hell and back until at the end they change back into flesh. The poems are structured into six parts, Bardo One to Six. Bardo is a Tibetan word meaning “intermediate state”. I won’t say more than that, but I read quite a bit on the subject in order to use all six. It’s a fascinating concept. The idea of doing a book of based on the four elements (earth, water, fire, air) by four women who had won Bram Stoker awards came out of a discussion I had with another author, Gerard Houarner. The more I thought about it, the more excited I became at seeing this book happen. I approached Marge Simon, Rain Graves and Charlee Jacob about the idea and they also loved it. I have known them for many years from writing conferences and admired and loved their work. I let each of them pick the element they wanted and I was left with Air, which was perfect for me. It didn’t matter what they wrote in their sections as long as the sections were close to the same size. They created amazing work for this book. I couldn’t be prouder of the final product. The cover by Daniele Serra is fantastic. Marge Simon is a double threat because she is a writer and artist. The full color section dividers are based on us and our elements and are breath-taking. Charlee also has a enhanced photo by her husband, Jim Jacob, in her section that is chilling. We were so fortunate that Rain talked with Roy Robbins at Bad Moon Books and they ultimately published a beautiful version of book as trade paperback and limited signed edition. Q. Finally, it has nothing to do with writing, but I love your tattoo. When I saw it I immediately wanted to call you “The Girl with the Dragon Tattoo”. If you don’t mind me asking about it – when did you get it and does it have any symbolism or special meaning for you? A. Ha, I have been called “The Girl with the Dragon Tattoo” and it makes me smile. The dragon is a mythical being and represents so much that I could spend a lot of time talking about it. One thing I will share with you is that when I was younger I was very shy and picked on in school. I had a very active imagination and would imagine that they were jealous because I had wings. I thought for a long time about getting a tattoo and what it would be and where. I am blessed to work with a top rate tattoo artist, Anil Gupta, for the dragon and one that I have on my back (see more about that on my site Galleries/Photo Albums/New tattoo 2008 set). It took about two and half hours and was worth every second. I’ve never regretted it. When I look at it I smile and feel quite happy to be different. Q. Is there anything you’d like our readers to know that I haven’t asked you yet? A. I am part of another book that came out the end of last year that I’m very proud of, Dark Duet. It is a collaborative book of poetry written with Stephen M. Wilson, inspired by music and is available as a paperback from Amazon as well as an eBook, (publisher Necon eBooks). Cover art by Kiri Moth and interior art by Jill Bauman, includes two separate (a duet) introductions one by Tom Piccirilli and one by Mike Arnzen, both authors that I greatly admire. Some of the poems we wrote together, some poems were written by one of us in response to the other’s poem. The experience with Stephen (who approached me with the idea) was extraordinary. He’s in California and I’m in New York; it was written through emails and we both worked without egos. The final result is a symphony images and story we hope others will enjoy. Thank you so much for allowing me to share my opinions with your readers. ~ by Sumiko Saulson on February 17, 2013. Reblogged this on Chocolate Girl Wonder.